My best double hammock works just as well in my yard as it does in my living room. Relaxing in a hammock is very pleasant on a summer afternoon. Although I couldn’t hang one from the trees in my yard, I found the perfect solution. You may be just as excited as I was when you see what it is. You can lay back and enjoy sunshine or shade anywhere you have space because it comes with a portable stand. I’d love to tell you more about it below. I really wanted a hammock for my family to enjoy this year. Specifically, I wanted a double hammock because it’s more comfortable for the adults in my family. I searched for one with a stand that is sturdy, stable, and easy to assemble. My preference was for a hammock that was truly portable so I could move it around without hassle. I searched for one with a stand that is sturdy, stable, and easy to assemble. My preference was for a hammock that was truly portable so I could move it around without hassle. My research was rewarded when I discovered the Vivere Double Hammock with Space-Saving Steel Stand. I was delighted with both the hammock itself and the stand. It even included a carrying bag for storage and transport. First off, this hammock is sturdy and strong. The bed and rope support up to 450 pounds of weight. It doesn’t have a spreader bar, but it measures 63 inches wide by 94 inches long, or 5-1/4 feet wide by almost 8 feet long. That’s big enough for two adults to snuggle, or just sit side by side. The kids love it because they have plenty of room, and will share it instead of fighting over it. I also like that the fabric is made of 100% cotton so I don’t feel sweaty from laying on it. The hammock I chose has the Tropical pattern with colorful stripes. The colors brighten up my yard. Next, I like the black steel stand very much. You’ll need about 9-1/2-feet of space to set it up. It’s simple to put together without any tools at all, but you will probably need another person to help hold it. Everything can be assembled in just two minutes. All the separate parts are tightened together by hand with the knobs on the frame. Then it’s just a matter of making sure the hammock ropes aren’t tangled and placing the loops over the hooks on the ends of the stand. Once it’s up and ready to use, it is surprisingly stable for a standalone hammock. The lowest point of the hammock is suspended about a foot off the ground. You can swing in it without fear of tipping over. When it’s time to take it apart, one person can do it by themselves. Both the hammock and the steel stand fit inside the duffel-type carrying bag. The whole set weighs about 35 pounds. Besides the Vivere Double Hammock with Steel Stand – the best double hammock, in my opinion, I found another hammock and a stand, both sold separately, that I also liked. While I chose Vivere’s solid cotton sling hammock, I also liked this white twisted rope spreader hammock from Best Choice Products. The spreader bar and net-like design make it cool for really hot days. It supports up to 450 pounds like the Vivere hammock and measures 59 inches wide by 80 inches long. It’s big enough for two adults to enjoy together. The spreader bar ensures that no one is cramped for space. You can hang this hammock from trees or posts, or place it on a stand that you can buy separately. These options give you more flexibility on how high you choose to suspend it. While it has some great features, I decided against this one for two reasons. One, buttons on clothes snag on the hammock material. Two, the hammock feels less stable than the Vivere. These two things may be unimportant to you if you prefer having the spreader bar and the net-like design. Along with the Best Choice Products hammock, I found the same company’s steel hammock stand. I’d like to tell you about it too. This 9-foot long black steel stand from Best Choice Products is made to support their hammocks. The manufacturer says it can hold up to 450 pounds of weight. Some users have commented that it flexes up to 3 inches when loaded with anything over 250 pounds. It’s simple to put together without tools, similar to the stand that comes with the Vivere hammock. The stand weighs 26 pounds by itself without a hammock. It also comes with a handy carrying case. Although both this stand and the hammock made by Best Choice Products are popular, I wasn’t as impressed with the build quality of this stand compared to the Vivere I purchased for my home. Best Choice Products even mentions that there may be “slight imperfections” in the metal work. My family enjoys the Vivere Double Hammock very much. This may be your top pick as it was mine, or you may find that the Best Choice Products hammock and stand are more what you want for your home. I’d like to tell you about how I came to choose these hammocks and stands as the best ones I found. I want my family to enjoy their relaxation time, and I want them to be safe. I looked for hammocks and stands that are stable and sturdy so I wouldn’t worry about my family using them on a regular basis. Of course, the hammock needed to be comfortable. I wanted material that wouldn’t feel sweaty on a hot day. I also investigated whether it felt nice to lie or sit upon. Since I couldn’t hang a hammock from trees or posts in my yard, I looked for hammocks with stands. I needed a stand that would be easy to set up and take down in a short amount of time, preferably without tools. Portability would also be handy so I could take the hammock camping, or move it around the house and yard. Selecting the best hammock for yourself and your family is ultimately based on your personal preferences. The Vivere Hammock and stand have made the summer more comfortable and relaxing for me and my family. I’d like to recap here why I like it, and why the other hammock and stand may be good for you, too. The Vivere Double Hammock with Space-Saving Steel Stand makes it possible for my family to enjoy a hammock at home. It’s comfortable, sturdy, and easy to assemble without tools. The hammock’s lively colors brighten up my yard. 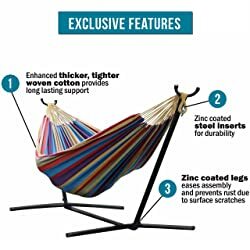 If you prefer an all-in-one solution, or like the solid fabric style of the hammock, get the Vivere hammock with its stand and carrying case included. The Best Choice Products Double-Wide Hammock with Spreader may be more to your liking because it has an airy, twisted-rope design. The spreader bar keeps it open flat instead of forming a cocoon. The Best Choice Products Steel Hammock Stand supports a hammock with up to 450 pounds of weight on it. It’s easy to assemble in a few minutes without tools and comes with a carrying case. 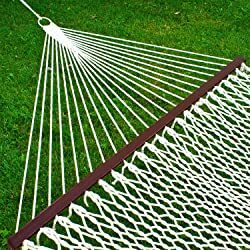 If you would like a flatter, more open hammock with a net-like style, get the Best Choice Products hammock with a spreader. If you don’t have a place to hang it, take a look at their steel stand, sold separately. 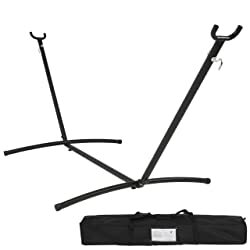 If you only need a hammock stand, Best Choice Products sells their easy-to-assemble stand by itself. Thank you for taking a look at this buyer’s guide. I hope it makes it easier to decide on the best hammock and stand for you. Please take a look at more reviews of products that make your home more comfortable and help you and your family enjoy to relax this summer.